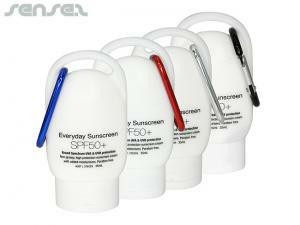 Nothing suitable in promotional sunscreen? How about custom branded beach fans, logo printed corporate beach accessories or one of our promotional headwear caps & hats? Australia is a region where Sunscreens really work to promote your brand. 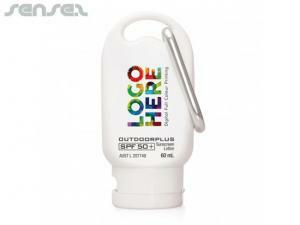 Our promotional sunscreen tubes and sunscreen bottles as well as sunscreen sachets with custom logo print are personalised with your logo and are suitable for any beach or outdoor event. 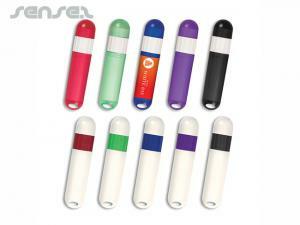 These marketing giveaways add value to any summer campaign! 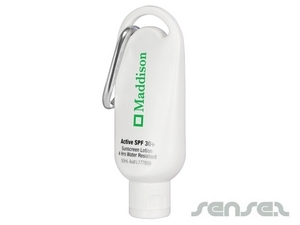 Our promotional sunscreen bottles and sunscreen tubes are Australian made and approved with SPF30, very high protection from UVA and UVB rays, and up to 3 hours water resistant. With custom printing and branding on our logo companies sunscreen bottles and sunscreen tubes, you'll be sure your brand will be noticed and admired on Australia's busy beaches, or wherever your target group is having a sun bath. 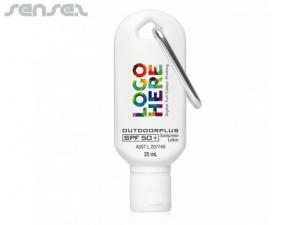 We also have available a smart looking promotional 50ml sunscreen tube with carabiner attachment; making it ideal for attaching to golf bags, back packs or school bags. You can also provide extra relief for the already sun burnt clients with our custom branded promotional after sun gel tubes. 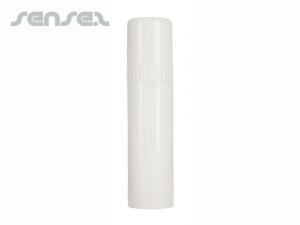 The gel has a pleasant refreshing fragrance and is readily absorbed leaving skin feeling soft and cool. For a large gift giveaway and direct mail or mail outs, try our promotional sunscreen sachets and promotional sunscreen squeeze sachets. Our custom printed and cheap branded promotional sunscreen sachets are cost effective and provide the perfect marketing tool for your business to ensure your promotion will be remembered. 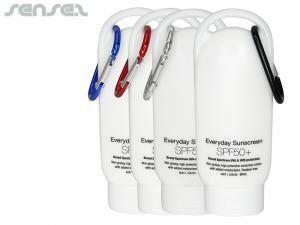 Promote your tourist resort with a custom branded suncream and slip slop slap your customers over the summer period!